I just love the way it turned out, though I half wish now that I had used a less colorful yarn. It will be hard to find a shirt to wear underneath, though it looks wonderful with either jeans or black tights. For the dress I’ve used size 4 needles (European size) and my favorite yarn. It’s called Lana Grossa Merino Superfein. The size of the dress is medium I guess (or 38 European size). I can’t quite remember which cast on I used, because I ripped it out several times before I found the perfect number of stitches. But I think it was a kind of invisible cast on. For the collar I knit several rows of k1 p1 ribbing (till I had about 3 cms), before switching to my multicoloured yarn. For those short rows in the back I split the 110 stitches 36 -38 – 36; knitting back and forth adding 12 stitches every time till I reached the shoulder stitch markers again. Edit: I ripped out the black ribbing for the collar after finishing the dress and redid it. It was just too lose for my liking. So I decreased by 5 stitches in the front and back in the first row (plain knitting), then did the next rows k1 p1 as before and decreased by 5 stitches in the front and back again in the last row before binding off. Shoulder increase: increase by 4 evenly spaced stitches in the front and back every 4. row till you have 150 stitches in the back and front. Sleeves: for the sleeves bind off 60 stitches on each side. There should now be 90 stitches in the front and back. The back and front are seperate now. Before joining them again knit/purl back and forth seperately for about 6 rows. Knit the first row and then increase by 2 stitches in every knit row. Knit the last one. There should be 98 stitches now. Join the front and back again and continue knitting in the round. 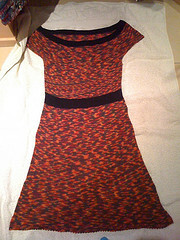 I did that for about 10 cm and started to increase for the “skirt” part of the dress right after the back stripe. Skirt Increase: For the skirt increase by 2 stitches in the back and front every 8. round till it has the right length. For my dress I increased till I had 140 stitches in the front and back.